Who else but Hershey Felder, well-known and beloved musician, actor and entrepreneur, could have adapted, produced and directed this incredible performance. 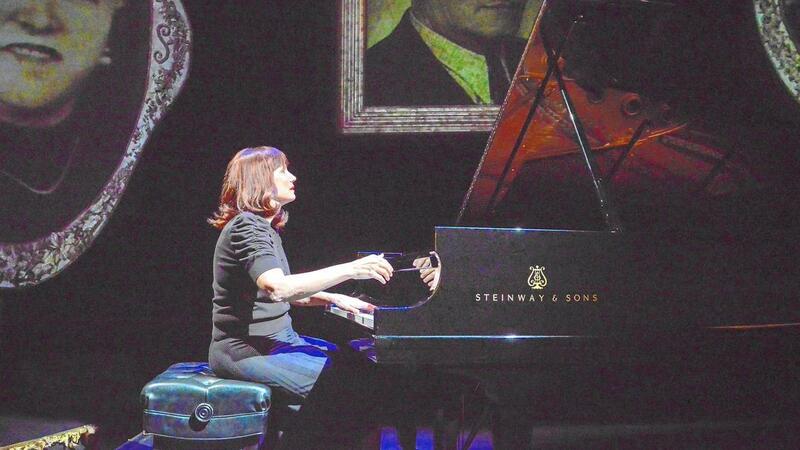 The story of Lisa Jura, Viennese pianist, started out as a book written by Mona Gobalek, her daughter, and is now adapted as a moving, and awe-inspiring live theater piece performed by Mona herself. Through music and story-telling she tells the incredible true story of Lisa’s life during the rise of the Nazis. In 1938, at age fourteen, Lisa’s Jewish parents placed her on a train in order to ensure her safety and she became one of the thousands of children who were transported to London as part of the Kindertransports. There she lived and practiced the piano in a hostel full of displaced children at Willesden Lane. Lisa’s mother (Mona’s grandmother) impressed upon her daughter to keep playing the piano; that no matter where life took her, she would always be there with her, through the music. And this advice was in evidence last night as her granddaughter, Mona performed. Mona’s prowess as a pianist is on display throughout the performance as she sprinkles her story with segments of pieces from repertoire ranging from Bach, Beethoven, Debussy, Rachmaninoff, Grieg, Scriabin and even Cole Porter. From a purely musical standpoint her playing is virtuosic and provides plenty of entertainment in and of itself, but she infuses the performance with vignettes of Lisa’s parents, friends and teachers, incredibly, often story-telling as she plays difficult pieces simultaneously. The set is simple, with huge, empty gold frames suspended from the ceiling that are filled with projections of footage from the time period, including portraits of her parents, children being herded onto trains, bombings and the London blitz. However, there are also light touches of humor sprinkled throughout and overall the show is anything but depressing. This is a story of survival and triumph told graciously by a master performer and musician.